A good friend of mine thought she had room in her house for a couple of Red Eared Slider turtles that were being given away. One was quite small and very active, and one was large and aloof. The smaller one was male and all of his time was spent trying to attract the attention of the larger female. But she took over the basking rock, and wouldn't give him the time of day. My friend named them Pepe and Carmela, and had a brief period in which she enjoyed having two turtles in her house. Then she realized that what little free time her job as a public school teacher allowed her would be spent cleaning the turtle cage, feeding the turtles, researching turtle care, smelling the turtles and listening to the filter run day and night, not to mention the piles of money flying out the door. The turtles had to go. That's where we came in. The "hike" center of my brain lights up. In Chicago, finding good hiking without massive amounts of driving can be a challenge, and the forest preserves that run along the mighty Des Plaines River on the western edge of city beckon. For safety and other reasons, it's better to go with pals, so we wrangle some friends and head to the parking lot near Thatcher and Bloomingdale, notice that, as usual, there are many cars, all containing a single man, and no one is parked right next to each other. All of the men in the cars collectively give off a definite "don't look at me" vibe. Having seen it before and knowing these men have zero interest in us, as we are women and children and not creepy men, we decide to ignore the male prostitution event going on, and head into the woods for our hike. Luckily I bring some garbage bags with me, and soon they are filled to overflowing with beer cans and all sorts of other kinds of trash. Ah, the refreshing woods. Is that a deer or a wild turkey I see over there? No, just a man swilling Scope from a bottle he keeps in the trunk of his car. Lovely. To the FBI I say, "Bring it on." But I digress. I decided the forest preserves were (are) too creepy for a turtle release, especially on a rainy day. We stowed Pepe and Carmela in a box in a backpack and headed up to The Grove, a nature center in Glenview. As much as I like the idea of a forest preserve, I like the idea of a nice, prostitution-free nature center better. There are plenty of excellent nature centers around, but for turtles, I have to go with The Grove. In the interpretive center there are tanks and tanks of turtles, fish, mudpuppies, frogs, water snakes and about ten thousand other creatures being cared for by the excellent staff and volunteers. The first thing you see is a huge trough of turtles of varying pedigree, all swimming around, climbing on top of each other and looking increasingly bizarre the more you look at them. 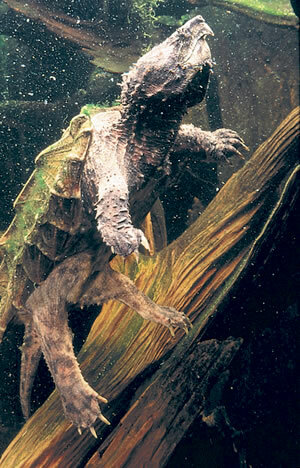 There is a tank with an Alligator Snapping Turtle that is at least 100 years old, and weighs something like a ton. It is a dinosaur, I'm telling you. All it does is sit in this tank, and not move, while 20 fish from big to giant swim around. Every 40 minutes or so it unfolds its wrinkly neck and floats to the surface and sticks its snout above the water for some good old fashioned air. Then it goes back to sitting. What in the world is that turtle thinking about? All of this is housed in a huge old log cabin with a rambling front porch overlooking a pond. We have seen turtles in this pond on many occasions, all looking like they were just about the happiest turtles in the land, so I figured this was a good spot for Pepe and Carmela. As soon as we started through the woods, the turtles took to scuffling around in the box. We found a good spot near the pond and set them down. The kids opened the box and turned them out. If there was a hare around to race these turtles to the pond, the turtles would have won, hands down. Whoever started the rumor about turtles being slow has never seen turtles hightail it to a pond. In about three seconds both turtles were snout first into the mud, and three seconds after that they were gone all together. One can only assume they are living there today, or else they died shortly thereafter. Either way, it's better than being in a tank in someone's living room, especially when that person is growing more and more resentful of your turtle-ness with each passing day. In addition to feeling like we had performed a karmic act of great importance, the turtle release had all of us a little worried that, by releasing Pepe and Carmela, we were inadvertently exposing the entire Grove turtle population to some deadly captive turtle germs. Thankfully these worries were put to rest a few weeks ago when my family found a box turtle on the path in Riis Park. There is a big pond there, but this turtle was pretty far away from the pond. It drives me insane, but all manor of pond life is scooped out of the pond, put into Jewel bags and dragged all over the park by enthusiastic, nature-starved kids. Then when they aren't allowed to bring the critters home, they dump the bag onto the grass. Why they can't just take it back to the pond is one of those questions that can be answered with "because their parents are lazy," such as, "Why is that kid throwing fast food trash out of the car window?" It's a good, all purpose answer. So our new turtle was a box turtle. Named Jicama. I researched the care and keeping of box turtles on the internet, and you'll never believe it, but I found there are many people who know a lot about taking care of turtles and go to great lengths, and sacrifice all sorts of money and free time doing so, and then spend even more time creating elaborate webpages detailing all of this information for idiots like myself, who really, when it comes right down to it, don't deserve such a nice turtle, because all I'm going to do it wish it away with all of my heart. According to the experts, we needed something to store the turtle in. We also needed something called "Orchid Bark," and clean dirt, with no styrofoam bits in it like the already paid for kind we had lying around. Off we went to Lowes. Twelve dollars poorer, we set the turtle in his palatial new storage box home, complete with ceramic hiding spot, and attractively appointed with two Texasware bowls filled with food that the turtle promptly trod in and filled with mud. Again we turned to the internet. The turtle people went on at length about the intricacies of getting a turtle to eat, the importance of temperature, and the best warming light to purchase. Then there was a whole long bit about burrowing and hibernating and on and on. As I already invest lots of money, most of my free time and the final shreds of my sanity in the care and keeping of three kids, my interest in this project was rapidly shrinking. I got on the phone immediately to find a turtle relocation station. I called The Grove. I explained the situation, expecting a lecture on how turtles can live for, I think, ever, and how I would be including this box turtle in my last will and testament, plus an invitation to join the Turtle Club. "Why don't you just release it?" she asked. Huh? Yeah! Why don't we just release it! She suggested putting it back in the Riis Park pond. I didn't want to find this turtle back on the path, or smashed on Fullerton Avenue, or lying dismembered at the top of the slide, so I thought maybe we'd go elsewhere. We picked the North Park Nature Center. We found the perfect spot in the shallow vernal pools off of the board walk. Tears were shed, and parting words spoken. For the second time in my kids' short lives they got to see a turtle hurtling toward a pond at the speed of light. It's becoming old hat. The Grove is located at 1421 Milwaukee Ave in Glenview. They are having their annual GroveFest on Sunday, October 1st. The North Shore Story Telling Guild will be there telling stories reflecting our past heritage throughout the day plus continuous live folk music, square and barn dancing, pioneer skill and craft demonstrations, and last but not least, "outdoor dining on hearty food!" It sounds like a good time will be had by all. The Grove also offers group tours and classes for kids in a Native American long house, a log cabin that was dismantled and moved to the site, and a replica of a one room school house. You can also do things like get married there. If you would like more information about The Grove, please call 847-299-6096. They don't have a website. I am on a crusade to take back our forest preserves. If anyone would like to join me, please get a group of friends and dogs and go to your nearest forest preserve as often as you can. Go for lots of walks, and let the creeps know they need to find a new spot for whatever it is they are doing back there. Singing loudly always helps. An example of something good going on in the Cook County Forest Preserve is the Little Red Schoolhouse Nature Center in Palos Hills. Loads of nice hiking trails that connect to the larger forest preserves in the area for longer hikes, or short, little kid-friendly ones right around the schoolhouse and a lake with a great little interpretive center. They have a turtle pond going on as well, which was endlessly entertaining to the baby I had with me the last time I was there. No dogs allowed here, but you can take your dog on the trails through the other parts of the preserve. I seem to recall some pretty strict picnicking rules that we broke and got busted for. Be careful with those cheese sticks people!